Check Out This Easy Recipe For Tummy-Soothing Pumpkin Dog Treats – Great For Older Dogs! Sometimes it feels like our world revolves around our fur babies and when they’re not feeling well, or have some sort of stomach bug, we just want to do what we can to make them feel better. Before, we would look at the ingredients in our pups’ food and not really know what was causing the digestion issues, but when we started making their treats ourselves we realized we could include ingredients that would help them feel better and get them back to normal! Pumpkin is great to include because it’s low-fat, but packed with fiber, beta-carotene, potassium, vitamin C and other nutrients. 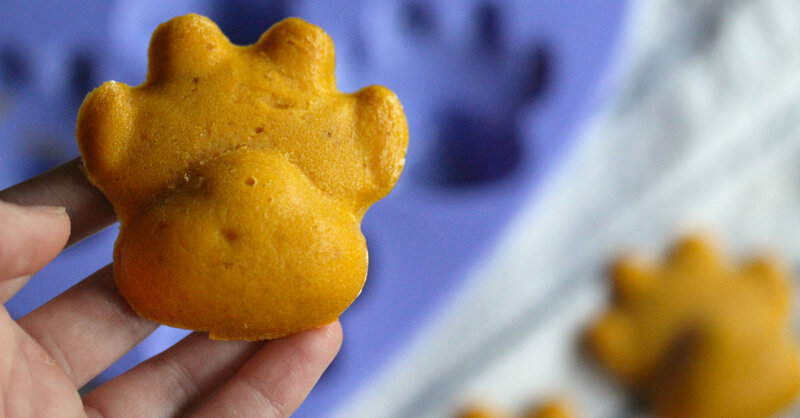 Whether your dog is old or young, pumpkin puree (note: NOT pumpkin pie filling which can be toxic to dogs) soothes the stomach and brings stability back to the digestive system…plus, when we make these treats using our adorable silicon paw print pan, it’s impossible not to love these!! In a medium bowl, mix together flour, baking powder, cinnamon and cloves. In a separate bowl, whisk together pumpkin puree, honey, eggs and canola oil. Once combined, mix dry ingredients into the pumpkin mixture until totally incorporated. Spoon mixture into your muffin tin/silicone mold, then place in oven and bake for 18-22 minutes, or until toothpick inserted in center comes out clean. Remove from oven and let cool before serving to your pups.